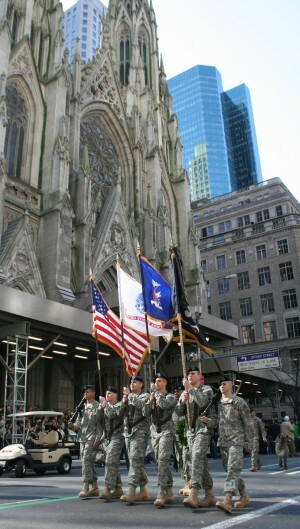 NEW YORK - Members of the New York Army National Guard’s 1st Battalion, 69th Infantry Regiment color guard pass outside Saint Patrick’s Cathedral during the New York City Saint Patrick’s Day parade March 17. The 69th Infantry, famouse for its part of the Civil War’s Irish Brigade, has long historic ties to its Irish heritage. The 69th Infantry has led the city’s Saint Patrick’s Day parade up 5th Avenue for the past 159 years. Photo by Lt. Col. Richard Goldenberg, 42nd Infantry Division. NEW YORK - Irish Defense Force Soldiers from the 58th Reserve Infantry Battalion joined the New York Army National Guard’s 1st Battalion 69th Infantry in the annual march up Fifth Avenue in the world’s largest St. Patrick’s Day Parade. The Irish Reservists marched separately from the 69th, which traditionally leads the New York City marchers --estimated to reach almost a quarter of a million this year-but they did join the Guardsman for the traditional post-parade festivities at their Manhattan Armory. More than 800 Soldiers of the New York Army National Guard’s 69th Infantry Regiment and support elements welcomed reserve members of the Irish 58th Reserve Infantry Battalion for mass at Saint Patrick’s Cathedral and the parade up Fifth Avenue. Thirty-eight soldiers from the 58th Reserve Infantry in County Sligo in Ireland joined their U.S. counterparts in the day-long celebration of Irish American culture. "This is truly a great honor and privilege for the 58th Reserve Infantry Battalion,” Commandant Gerry Jordan, unit spokesman, told the Irish Examiner newspaper before the trip to New York. “This has been reflected in the number of members taking part, totally at their own expense." Commandant Fintan Dunne, the Commander of the 58th Battalion, added that this is the first official military unit of the Irish Defence Forces to march in America since the funeral of President John F Kennedy in 1963. The two military organizations share a common bond in Col. Michael Corcoran, a native of Ballymote, Ireland and commander of the Irish regiment for the Battle of Bull Run in the American Civil War. New York City Mayor Michael Bloomberg unveiled a monument in Ballymote in 2006 on behalf of the 69th Infantry Regiment and its Irish ties. The 69th Infantry here in New York City has served as the St. Patrick’s Day parade Honor Guard since 1851. Anti-immigrant emotions in that era often lead to violence, and the troops of Irish heraldry have led the city parade in every year since. The regiment received its nickname as the "Fighting 69th" from Confederate General Robert E. Lee during the Battle of Malvern Hill in 1862 in Virginia. Returning to New York again this year was Gen. Martin Dempsey, Commander of the U.S. Army Training and Doctrine Command and made an honorary member of the regiment. While he was being introduced, Dempsey stepped up to the microphone to interrupt Andonie. Dempsey spoke about the importance of military organizations to sustain connections to their past and their community. The 69th Infantry, Dempsey said, is the gold standard for celebrating those relationships. Dempsey again impressed the gathering of nearly 1,000 Soldiers, veterans, family members and supporters from the New York community with song. “And when the war is said and done, may heaven spare our lives For its only then we can return, to our loved ones and our wives We’ll take them in our arms, me boys, for a long night and a day And we’ll hope that war will come no more, to sweet America.